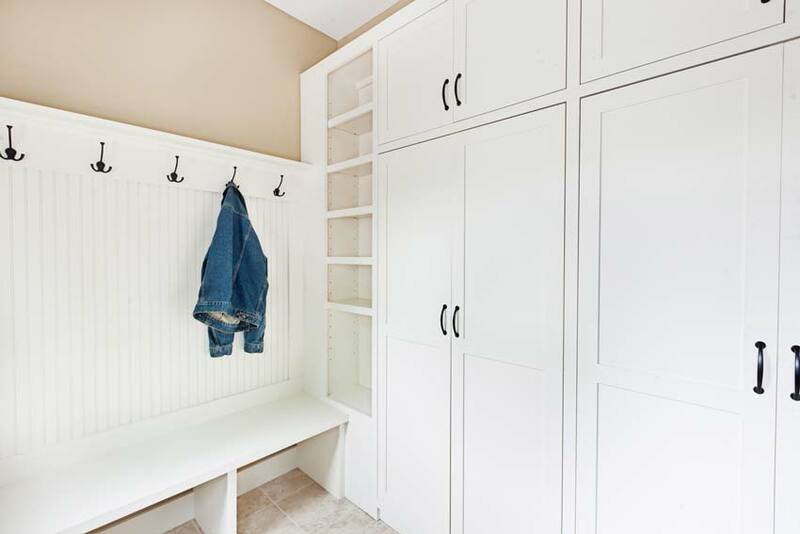 No matter what your situation is – family of five, a couple with a lively dog, or even a single person – a mudroom can be beneficial. No matter the season, a place to unload snowy boots, wet umbrellas, or sandy sandals will help keep the home tidier as well as provide a central location for oft-used items. There are a few ways to accomplish a mudroom, depending on size, proximity to utilities, and where you want it located. Adding some durable flooring, hooks for coats, bins for boots or cleats, and some way to keep the area shielded from the rest of the house can be a relatively easy transformation. How big, or small, your mudroom needs to be depends on your lifestyle. A large family that spends a lot of time outside or playing sports might need more elbow room than a single person that only gets outside to walk the dog. A mudroom can be beneficial to both. If there is already a place that lends itself to a mudroom, maybe a spot off the garage or near the front door, the transformation is easy. Adding some durable flooring, hooks for coats, bins for boots or cleats, and some way to keep the area shielded from the rest of the house can be a relatively easy transformation. If you don’t currently have that space, consider taking some square footage from an existing room. Expanding the front closet into a different room for example. Losing a little square footage in the living room could be a small price to pay to keeping an orderly home. While you can almost always tie into the wiring of a home – every room has to have a few outlets – plumbing can be a different matter. A great place to consider adding a mudroom is near the laundry room. If it isn’t already installed, adding a utility sink for cleaning off muddy boots or cleaning paint brushes is an easy addition. If the laundry room is on an exterior wall, consider building a small addition to act as the mudroom. That way you can build it to match your lifestyle, adding storage, seating, or even a small dog-washing area. Consider where most of the family foot traffic comes from. The front door, from the garage, a side door, or even from the backyard should help you with this decision. It wouldn’t make sense for people to walk through the home to get to the mudroom. From there, plan how much room you might need to fit your lifestyle and decide if that square footage currently exists in your home. No matter where you want to place the mudroom, Designers Northwest will remodel existing area to fit your needs or add additional square footage if needed. No matter your situation, a mudroom can help keep your home cleaner and give you an area for all of your outdoor gear. For more information about a mudroom addition, contact Designers Northwest today.